Light Up Unicorn Slippers: Cozy, colorful slippers with LED lights. 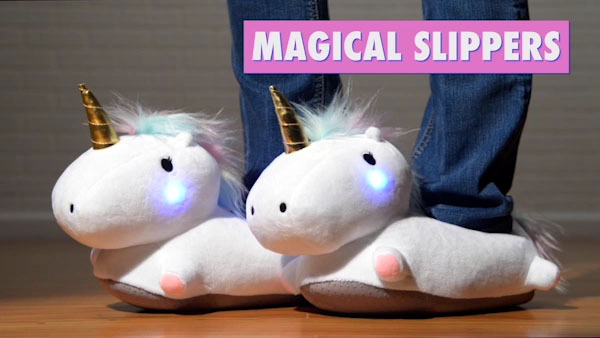 Add magic to your morning when you snuggle into a pair of Light Up Unicorn Slippers. 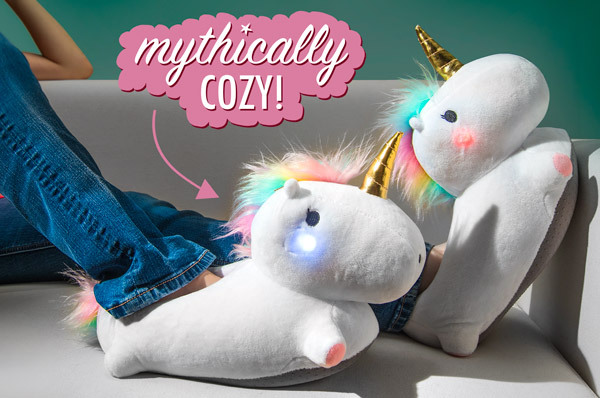 These ultra-cozy padded slippers look like adorable unicorns, with LED lights in their cheeks shining like darling dimples. Flip the switch inside each creature’s horned head to begin an eight-color light cycle. The illumination is great for a late-night quest to the fridge or a much-needed dose of color in the morning. Even when not lit up, these whimsical mythical creatures’ multi-colored mane and tail, along with their gleaming golden horn, will surely still brighten your day. The mythological embodiment of purity and grace is now using its magical abilities to keep your feet warm and comfy. 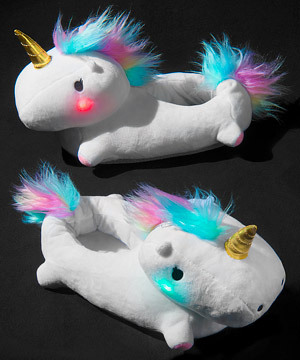 Light Up Unicorn Slippers are fun and colorful additions to your loungewear. The rainbow mane stands up like a magical mohawk, and the horn (while not known to contain the healing properties of myth) is made of shiny gold fabric. Slip them on and whisk yourself to a kingdom far away… or at least to the kitchen to get coffee. Have a good mythical morning. Getting cozy is about feeling warm inside and out. Nothing gives you that delightful warm feeling like an adorable fairy tale creature, and nothing keeps you warm like a plush pair of padded slippers. Let your feet lounge in the hug of these cute critters while you relax at the end of the day. Kick back with your new fabled friends. Power cords don’t have a place in mythology. 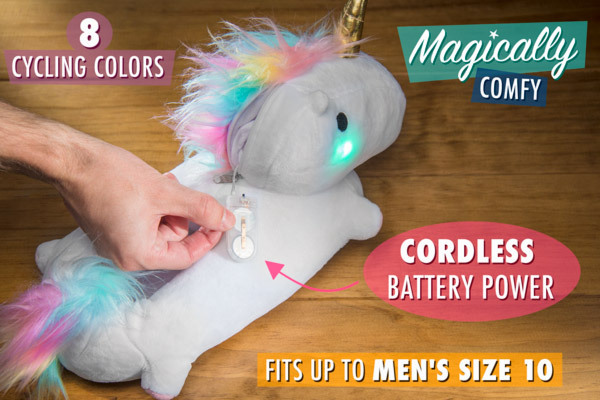 That’s why Light Up Unicorn Slippers use a discreet battery pack to power their delightful colors. The included lithium batteries are comfortably hidden inside the unicorn’s head for an unobtrusive way to light up your morning. With a quick flip of the battery pack’s switch, the two LEDs in each slipper cycle through a rainbow of colors to provide a full spectrum of brightness. 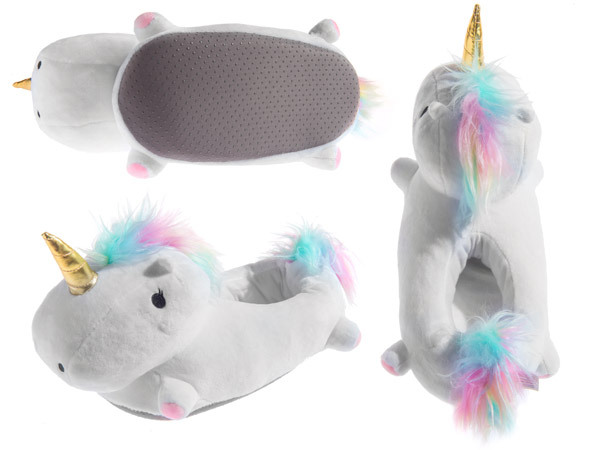 The Unicorn Slippers have a textured sole for better grip and are made from cozy cotton and polyester to keep you warm. You don’t need to be a maiden pure of heart to tame these creatures; the slippers fit up to men’s size ten (women’s size twelve) and are available to anyone with a sense of fun. And if you want a different pair for morning and night, you may also enjoy the unicorns of the sea. Question: Where is the battery pack? Answer: The battery pack is hidden inside a zippered compartment in the unicorn’s head. The zipper is covered up by the mane. Question: Are the batteries replaceable? Answer: Yes, just use CR2032 lithium batteries. Question: Are there different sizes? Answer: The Light Up Unicorn Slippers are one size fits all. They should fit up to women’s size 12 (men’s size 10). Question: Can I throw these in the washing machine? Answer: Unicorns don’t do great with washing machines. It’s best to spot-clean with a warm cloth.